“That’s a bit of a niche area, isn’t it?”. When telling people I work in the shirt industry, this is the kind of sentence I’m usually met with. In many ways it’s an understandable statement, shirts seemingly come and go every year on a conveyor belt driven by corporate greed. But reality paints a different picture. 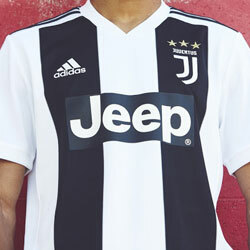 For the past several years, there’s been a growing appreciation for the design and stories behind football shirts both from recent seasons and years gone by. One of the biggest influencers behind this growth has been Classic Football Shirts, a company now synonymous with the shirt industry. 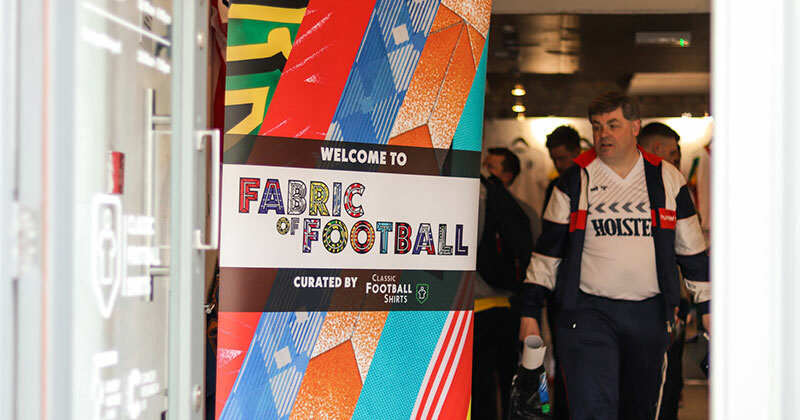 This week saw CFS bring their new Fabric of Football exhibition down to Shoreditch, London. We went down to see the exhibition, and it’s sister pop-up shop, for ourselves. The results were clear to see. The pinnacle of Dortmund shirts. Our first point of call was a visit to Classic’s pop-up shop. The timing of the stall couldn’t have been better, coinciding with this year’s Football Shirt Friday, though as soon as we arrived we immediately noticed a problem, we were going to struggle to get in the door. There was a queue just to get in, a reflection not just on the popularity of shirts but also the range of pricing, teams and designs available. On one side, shirts from recent years lined the rails. 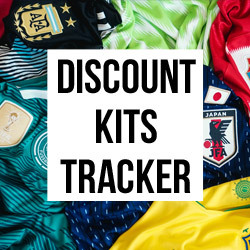 This is where you’d find bargains like a 2015 Jamaica Home shirt for £14, or a Player Issue Columbus Crew Long Sleeve Home from the same year for £24. Everything that is good about Classic Football Shirts was evident, with a wide range of teams which offered something for everyone. Opposite these shirts was the rarer end of the market, with an original 1983 Chelsea Away shirt hanging alongside a 2004 Henry Arsenal. It was quite clear why there was such a buzz around the shop, and why talks of a more permanent setup both in London and Manchester make a lot of sense. Welcome to the exhibition, featuring the greatest Spurs shirt of all time. 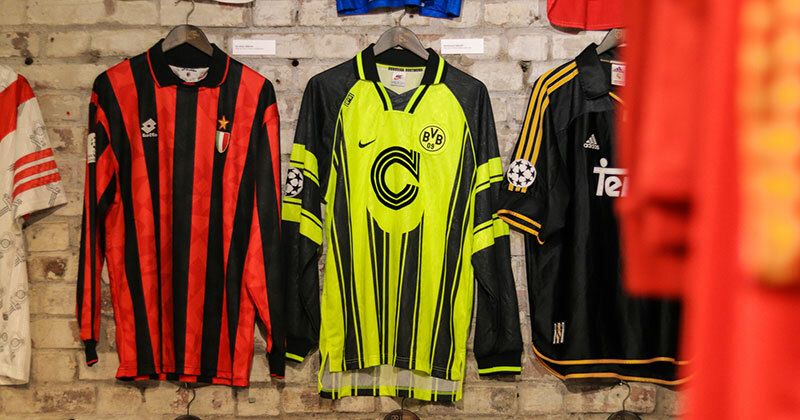 We then moved on to Fabric of Football, the main event which brought together a unique collection of shirts which was quite simply stunning. 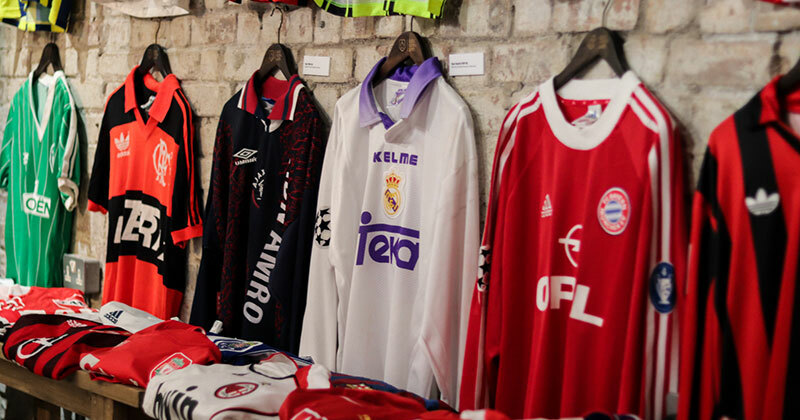 Not only did the collection include match worn shirts which made us pause for breath (we’re looking at you, Real Madrid 2001 worn by Zinedine Zidane), stories were told of how technology and design have influenced the industry in exciting, and at times shocking, ways. On one wall was an eye-catching set of goalkeeper shirts, predominantly from the 90s, with my personal favourite being a 1993 PSV Goalkeeper shirt which summed up the audacity of designs from the era. 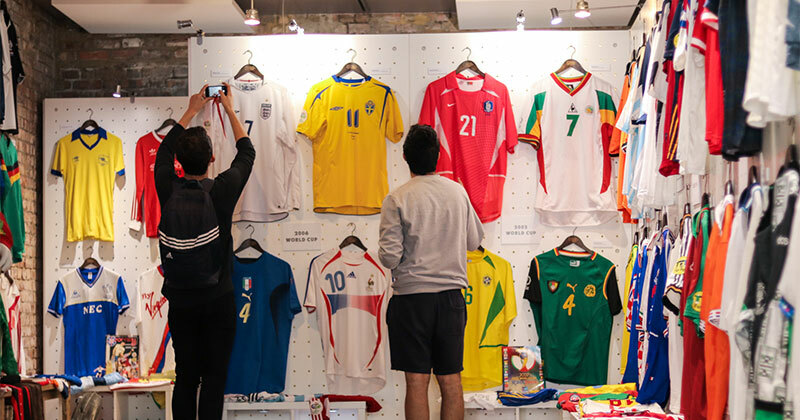 Other walls were grouped by tournament, giving a glimpse at both iconic kits and lesser-known numbers from competitions such as Italia 90, or Japan/Korea 2002. I spent several minutes admiring Cameroon’s shirt from ‘02, where they were forced to add sleeves to their sleeveless design shortly before the tournament, resulting in a unique look which may never be seen again. Amongst some superb shirts, the Cameroon number (bottom right) stands out. What struck me was not just the quality of shirts on show, but the atmosphere and buzz surrounding Fabric of Football. As we wandered round, we noticed a man sporting a flat cap and a fantastic 80s Watford shirt taking photos with the crowd. 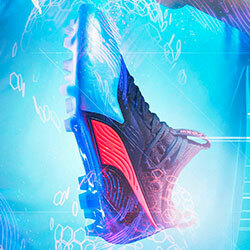 It turned out to be legendary striker Luther Blissett. Rather than being a PR stunt, Luther had turned up of his own accord, keen to see the collection for himself and more than happy to chat to people about his favourites for the World Cup, and who England should take on the plane to Russia. It wasn’t just Luther Blissett who was happy to talk however, Classic Football director Doug Bierton was keen to wax lyrical about the players and moments that kicked off his love for shirts (look out for an interview with Doug later this week). 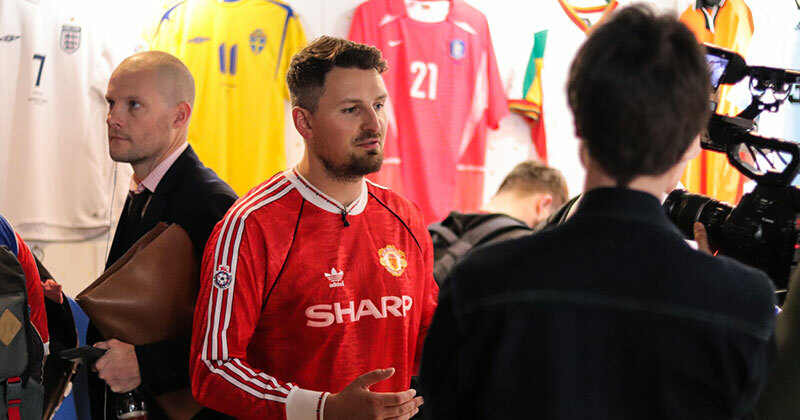 His insight and passion added significant depth to proceedings, highlighting the reasons the football shirt industry connects people from all corners of the globe, from football fans through to casual observers. Classic Football Shirts founder Doug Bierton. One story from Doug summed up the event perfectly. Soon after Fabric of Football opened a young fan came in, desperate to catch a glimpse of Ronaldo’s Brazil shirt from France ‘98. Upon seeing it he couldn’t contain his excitement, visibly showing emotion as he poured over the details of the kit. He later told Doug that whilst he didn’t have the money on him, he would return later in the week to buy it from the pop-up shop. Though sceptical at first, Doug explained how he did indeed return, this time with a group of friends, to proudly purchase the kit. Some of his friends were more receptive than others, but the lad’s passion and pride in owning this little slice of history was clear. 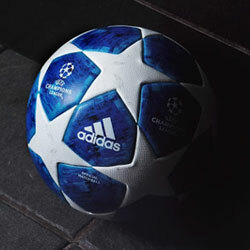 The work of Classic Football Shirts boils down to this unbridled truth, football shirts are more than just shirts. The past is tangible, whilst at the same time new stories can be told. Fabric of Football was a celebration of this and the sheer popularity of what went down in London last week, evidenced by the wide press coverage the event received, is testament to the fact that the shirt industry is quickly outgrowing its former niche status. If, like me, you are now struggling not to open your wallet in a frenzy of shirt shopping, the best place to be is here on FOOTY.COM. We compare shirts from a number of retailers, including Classic Football Shirts, so you can play more, pay less. The Divine Ponytail was no stranger to a beautiful shirt. We enjoy some of his best here.